Bettis was established in 1929 as an oilfield supply house and manufacturers' representative. The company later evolved into a manufacturing organization, becoming a pioneer in the valve actuator business. Bettis products are used in almost every energy-related industry, including oil and gas production - both onshore and offshore - oil and gas transmission, petrochemical and petroleum refining. Other markets include chemical, power industry including nuclear, pulp and paper, food and beverage, pharmaceutical, textile and water system. Bettis' CBA-Series pneumatic actuators are compact, lightweight and ideally suited for automating ball, butterfly and non-lubricated plug valves, or any quarter- turn (90 degree) rotating mechanism. These efficient, low maintenance actuators, with optional controls, provide a reliable method of operating and confirming valve position for a fully automated process. The CBA-Series, available in double-acting and spring-return models, are independently certified to BS 5490: 1977 - IP66 and IP67M for water ingress protection. Double-acting CBA-Series actuators, requiring pressure to rotate in either direction, are available with guaranteed minimum torque outputs to 12,245 lb-in (1,384 Nm). The CBA-Series spring-return models require pressure in only one direction of travel and are suitable for fail clockwise or counterclockwise applications without modification. These models produce guaranteed spring ending torques to 4,971 lb-in (562 Nm). 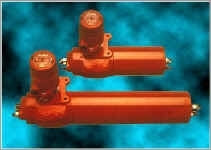 Standard construction CBA-Series actuators are designed for operating temperatures of -20°F to +200°F (-30°C to +95°C). High temperature trim allows continuous operation from 0°F to +350°F (-18°C to +177°C). Additionally, low temperature trim allows operation from -40°F to +180°F (-40°C to +82°C). Consult factory when temperature requirements exceed these limits. Operating pressures for the CBA-Series range from 40 up to 150 Psig (3 to 10 Barg). The WellGuard? piston range of pneumatic Control Fluid Powered linear actuators is designed to be used in conjunction with Bettis valve bonnets to provide open and close control for major brands of API 6A through conduit reverse acting gate valves fitted to oil and gas wellheads and production flow lines. These actuators can be used with API 6D and ANSI B16.34 valves where the bonnets are built to Bettis design. The company headquarters in Waller, Texas (near Houston) houses more than 145,000 square feet of covered manufacturing, research, engineering and office facilities. Bettis also has an 88,000 square foot manufacturing facility in Canada, a valve automation facility in France, and a direct sales office in the United Kingdom. Since Bettis Corporation's inception, it has continuously expanded both its physical capacity and its product lines. Its growth has come, in part, from the acquisition of some of the world's most reputable actuator manufacturers with a myriad of offerings and specialties. As a result of these acquisitions, Bettis now operates plants worldwide coupled with a global sales and distribution network unmatched in the industry.